Summer’s over, and while it’s sad to say goodbye to beach days, barbecues, and bikinis, there’s so much to love about fall. Show your love for this season with gorgeous autumn colors and seasonal designs. Now is the time to break out these blues, golds, oranges and browns. Whether you’re a beginner or a nail art pro, we’ve got a design for everyone. If you’re looking for something more official, yet with slight twist – check Classical Nails for Beginners. Alright, here’s what we’ve picked up for you for this beautiful autumn. We love this dark matte navy blue. You can recreate this look by using a special mattifying top coat. 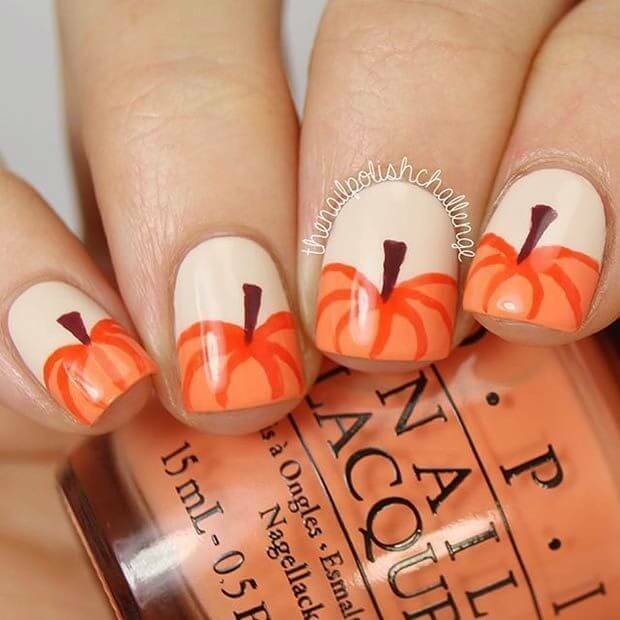 Proclaim your love for everything pumpkin with these adorable pumpkin nails. You’ll need beige and dark brown nail polishes as well as two different orange ones — a darker orange and a lighter orange. There’s no need to dismiss brown as a nail color; combine it with gold glitter and you’ve got a winning fall nail combination. Throw in a cool geometric design and you’ve got some winning nails on your hands. These have a different design on each nail yet flow together seamlessly. You’ll need three different polishes: a blue-gray gel or gel-finish polish, a gold glitter polish, and a regular gold polish. Use a toothpick or a very small brush to create the arrow and dot design on the index finger. For the middle finger, apply several layers of gold glitter polish until relatively opaque, and for the pinky finger apply a few coats of the blue-grey polish and finish off with a swipe of gold glitter. It wouldn’t be a fall nail list without a deep forest green. After applying several coats of the green, take your nails to the next level with a few small arrow accents on the ring finger using a small nail art brush. Finish it off with a shiny top coat. You’ll love this deep burgundy wine nail look, complete with a gel finish and chunky gold glitter. You only have to do this leaf design on your thumbnail, so why not go for it? Use a gold nail polish for the leaf and a gold glitter polish for the ring finger accent. Be the envy of all of your family members on Thanksgiving with this beginner-friendly turkey nail art. You can use any red, beige, orange, or yellow you have for the leaves and turkey feathers. Pro tip: dip the end of a paintbrush in black nail polish to get two perfectly circular black dots for the turkey’s eyes! We love glitter polishes with multiple colors — they add so much dimension and shine to a nail art look. Invoke hot chocolate, falling leaves and Thanksgiving foods with a brown and copper, gold and silver nail look. While you may have put away your bright pink summer polishes, there’s no need to shun the color entirely. This muted, pinky purple and pinky beige is just the right color for fall. To get the stripes, you can use tape and a small brush or a stencil. Sometimes you just need to let someone else do it for you. In this case, we mean nail art. Decals are cheap and can create stunning detail otherwise impossible with a paint brush and polish. Leaf decals are perfect for fall and easy to apply. Go for maximum impact with contrasting gold and navy. All you need are a couple of coats of navy polish and just one swipe of gold chunky glitter polish. This black and white design is spooky and simple. Create a smooth black base and take a fine paintbrush to carefully create three vertical lines. Then, make a “U” shaped line in between your three lines. Let completely dry and finish with a top coat. If you’re a sucker for anything cat-related, you won’t be able to resist these cute Halloween-themed cat nails. You’ll need lavender, black, and white to do this design as well as a thin nail brush. You could also try it with any other base color you like. Combine trendy stripes with a seasonal ombre and you’ve got this sparkly fall nail design. To achieve this look, you will need beige for the base and brown, shimmery dark pink or red, and shimmery orange or gold for the stripes. Don’t forget to use tape for precision.